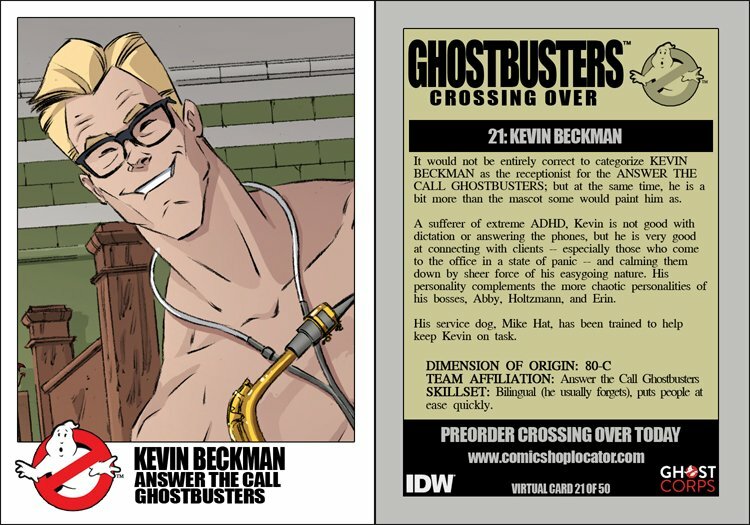 It would not be entirely correct to categorize KEVIN BECKMAN as the receptionist for the ANSWER THE CALL GHOSTBUSTERS; but at the same time, he is a bit more than the mascot some would paint him as. A sufferer of extreme ADHD, Kevin is not good with dictation or answering the phones, but he is very good at connecting with clients -- especially those who come to the office in a state of panic -- and calming them down by sheer force of his easygoing nature. His personality complements the more chaotic personalities of his bosses, Abby, Holtzmann and Erin. His service dog, Mike Hat, has been trained to help keep Kevin on task.